The Grand Canyon … words, photos, even film, in no way capture the magnitude and beauty of this natural wonder. I visited the Canyon for the first time last summer. Walking up to it, I was at a complete loss for words. I just stopped, stared, and for that moment it was the only thing that existed. It is hard to explain the feeling you get when a vision of nature’s beauty suddenly makes you feel so tiny. It’s the feeling you get when you stare into a calm ocean from an empty beach or hike a winding path in a quiet forest. Truly remarkable. Months later I found myself reading a new book. 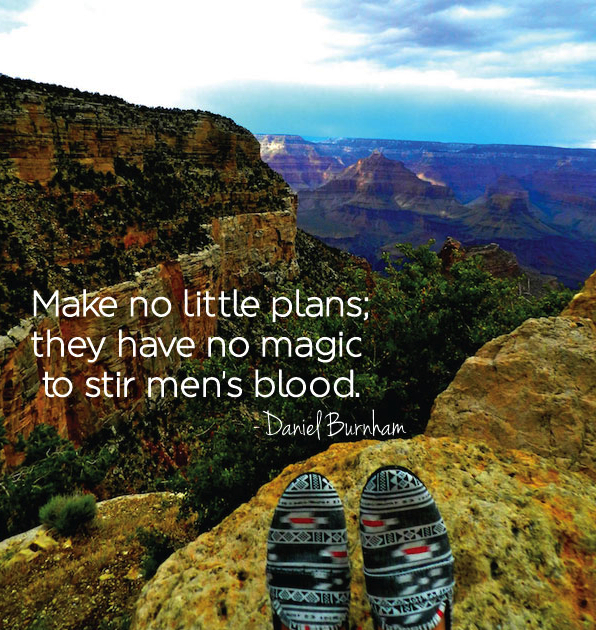 In it I found this quote from Daniel Burnham, “Make no little plans; they have no magic to stir men’s blood”. I liked it so much I highlighted in my book, something I hadn’t done since college. In my mind, it fit perfectly with the feeling I had sitting on that rock (with my newly purchased “canyon shoes”), thinking about how I should travel more, see more, experience more. In a world where something of this magnitude exists, you have to dream bigger and push further to make an impact. I decided to add the quote to the photo as a constant reminder of that feeling. Whether you print and frame, transfer onto canvas, or make unique postcards, this is a great way to add a personal touch to some of your favorite photos.